As a mom, I know how important it is to kill germs and to keep my kids healthy. That's one reason why I was excited to hear about safeHands hand sanitizer. My fellow blogger Alison from Couponshopaholic recently did a review of this product, and I'm happy to be able to help her run a giveaway for 5-pack of safeHands samples! sanitizes and kills 99.99% of all germs. I recently had the opportunity to review safeHands and I must say I was very impressed with the product and how it didn't dry out my skin. I loved the clean feeling and the scents were amazing! The first thing that caught my attention was that safeHands doesn't contain alcohol which tends to dry out your skin and can be found in most Hand Sanitizer products. As Pictured above I received one each of the safeHands Clean Linen and Cucumber Mint. I loved the way they both smelled and how my hands felt clean and didn't have that sticky feeling afterwards as with so many other hand sanitizer products out there. I was also lucky enough to receive safeSquirts for kids. Those of us with children know the importance of teaching them how important it is to keep there hands clean and what better and fun way than with safeSquirts. The kids will love the vibrant colors and the fun smells such as Cool Blue, Bubble Gum and Tooty Fruity. Great way to make hand washing for for the little ones. 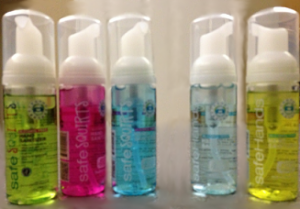 safeHands comes in 3 convenient sizes: 1.75 fl oz, 7 fl oz, and 18 fl oz. I received the 1.75 fl oz, and they are great for on the go to throw in your purse, diaper bag or even your child's lunch box. One lucky winner will receive a 5 pack sample kit just like is pictured above. You too will soon get to experience the joy's of safeHands and safeSquirts. This giveaway is open to US residents 18+ and ends on 3/18/13 at 11:59 PM CT.
You can find safeHands products on their website, check them out on Facebook and follow them on Twitter. I received safeHands Hand Sanitizer in order to do a review, all opinions are my own and were not influenced in any way. 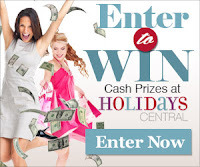 Disclaimer: Frugal Follies was not paid for this giveaway and is not responsible for prize fulfillment. Nice! right on time. :-) thanks for this wonderful opportunity. Cool. Love the packaging. Thanks!